Stunning view from the Klakkur Peak accessible from the town of Klaksvik (Right). From Left to Right: Eysturoy, Kalsoy, Kunoy & Bordoy Islands. Kunoy, meaning “woman island” is located in the northeastern part of the Faroe Islands. We traveled here via ferry from Syðradalur, Kalsoy to Klaksvík, Bordoy. From Klaksvík, we drove up to Kunoy village on the island of Kunoy. Our stay here was brief, but the village of Kunoy offers great views of the adjacent island, Kalsoy, or “man island”. Our top recommendation while visiting Bordoy is to hike from Klaksvík to Hálsur and finally up to Klakkur. Although Klakkur only stands 413 meters high, the view of Klaksvik below as well as the view of Eysturoy, Kalsoy, Kunoy and Bordoy beyond are well worth your time and effort! The hike is about 8-9 kilometers long, takes apporximately three hours round trip to complete, and is not strenuous. 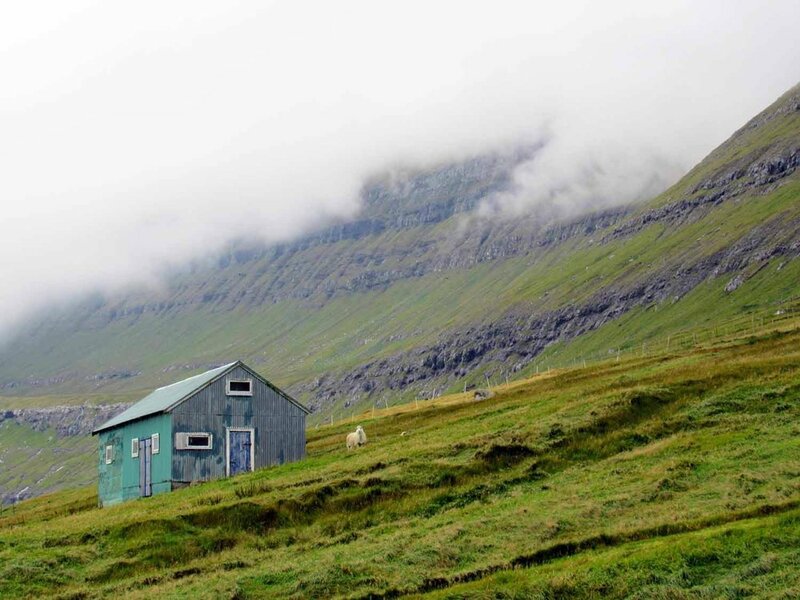 For more detailed trail info, check out the Faroe Islands Official Travel Website. With a population just shy of 5,000 people, Klaksvik is the second largest city in the Faroe Islands. Originally settled by vikings, Klaksvík didn’t become a cultural and commercial epicenter for the Faroese people until the 20th century. If you want a great view of Klaksvík, be sure to hike up to Hálsur and then on to the summit of Klakkur. It’s the perfect spot for your sunny afternoon nap. Christianskirkjan / Christianschurch is the first modern church in Scandinavia to be constructed in “Old Norse” style. The roof construction, similar to historic viking halls, has proven to be acoustically beneficial for church services. The church is dedicated to fallen sailors of World War II. An 8-man rowing-boat from Viðareiði (used to transport the priest between villages) also hangs from the church ceiling - a daily reminder of the sea-faring way of life for the people of the Faroes. Viðareiði, meaning “wood isthmus”, is the northernmost town on the eastern island of Vidoy. The island is easily accessible by a causeway which connects Vidoy to Klaksvik on the island of Bordoy. We had big plans to hike the nearby peak of Villingdalsfjall (844 meters); however, those plans were put to rest due to a very rainy day and slick hiking conditions. On a good day though, the views from the summit would be unreal! View of Fugloy & Svinoy Islands from Vidareidi. Viðareiði’s church, built in 1892 includes silver as a gift from the British government, thanking local citizens for their aid in rescuing their shipwrecked vessel, Marwood, in 1847. The previous 17th century church was destroyed during a storm, during which many of the coffins from the cemetery were lost at sea. Coffins that could be recovered were reburied in Viðareiði.